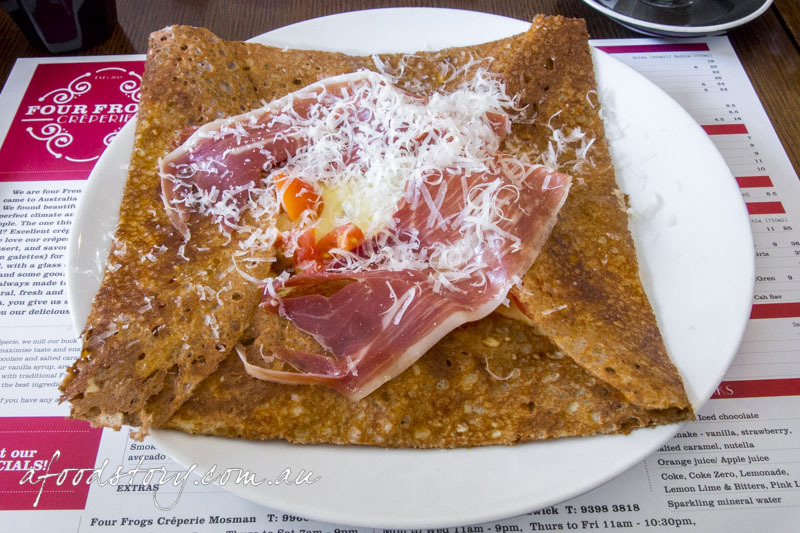 The last time we were in Melbourne we sussed out the crepe offering at Roule Galette which wasn’t too shabby at all, but I was keen to find a crepiere closer to home to satisfy my crepe cravings. And when in the space of just a few days a handful of people told me about Four Frogs I took it as a sign. We set off on a Sunday morning adventure over to the north shore with our friends Arch & Mim in search of delicious galettes and crepes. 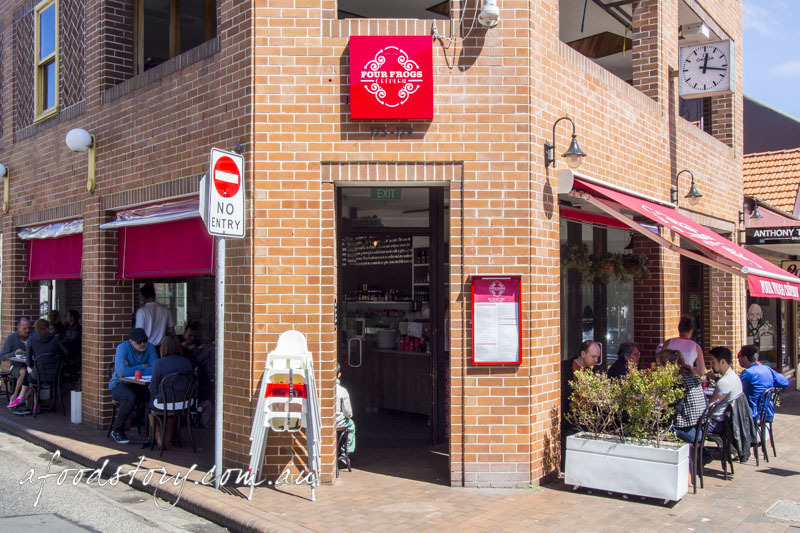 Four Frogs was opened by four Frenchmen who came to Sydney and loved everything it had to offer. With them they brought a little bit of France. Florian Guillemard, Four Frogs’ founder hails from Bretagne (Brittany) where the crepe originated. Having heard good things we weren’t surprised to find the place bustling when we arrived. But good things come to those who wait and we were happy to soak up the glorious sunshine while we did. In the end the wait was only about ten minutes, if that. We were off to a good start with French speaking waiters. The next thing to do was decide whether to choose savoury galettes or sweet crepes. Easy, both! But while I wake up and am already thinking about breakfast, having just dreamed about breakfast, and no doubt planning lunch in the back of my mind, Dylan needs one thing to kick start the day. Coffee. And although we’d had a coffee before we left home some days require multiple coffees. 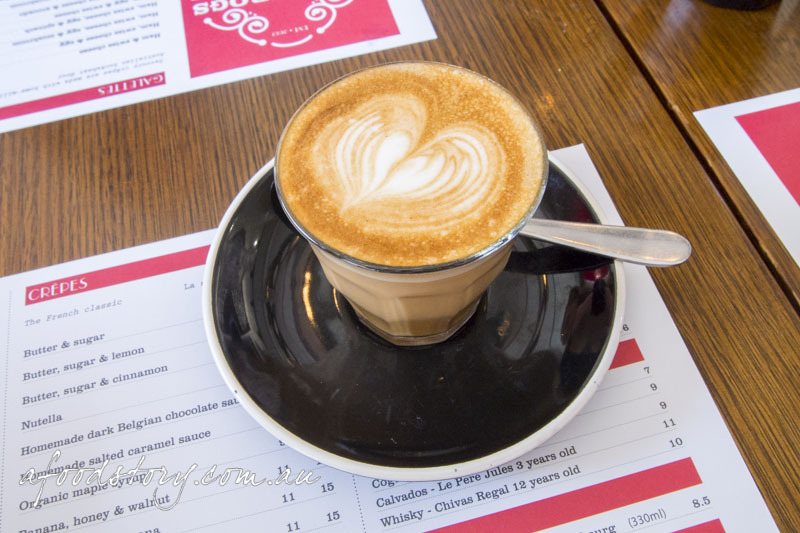 If you’re like Dylan and need a coffee (or two) and you manage to resist pairing your galette with a cider or a milkshake I am pleased to report that Four Frogs make a decent coffee. Spinach, feta, mushroom & avocado galette ($14.00). I’m a bit of a sucker for cheese and spinach (just ask Dylan, EVERY TIME we go to a festival/concert/football/event and there is a gozleme stall I am in there in a flash) and so I was instantly drawn to the spinach, feta, mushroom and avocado galette. I know, I know, it’s not traditional, but we’re not in France so I’m sure it’s ok! The galette came out golden brown and piping hot. 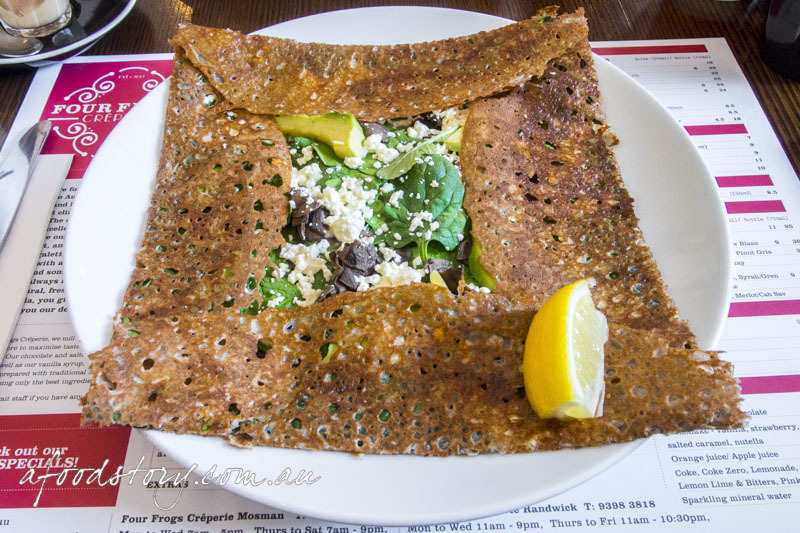 The buckwheat crepe was delicate and whisper thin, nicely golden and crisp without being dry. I loved the combination of fresh spinach leaves with lightly wilted ones, buttery mushrooms, salty kick from the feta and creaminess of the avocado. Spinach and feta are a classic combination but the earthy mushrooms and creamy avo made it well rounded. A fresh squeeze of lemon added that perfect acidic finish. 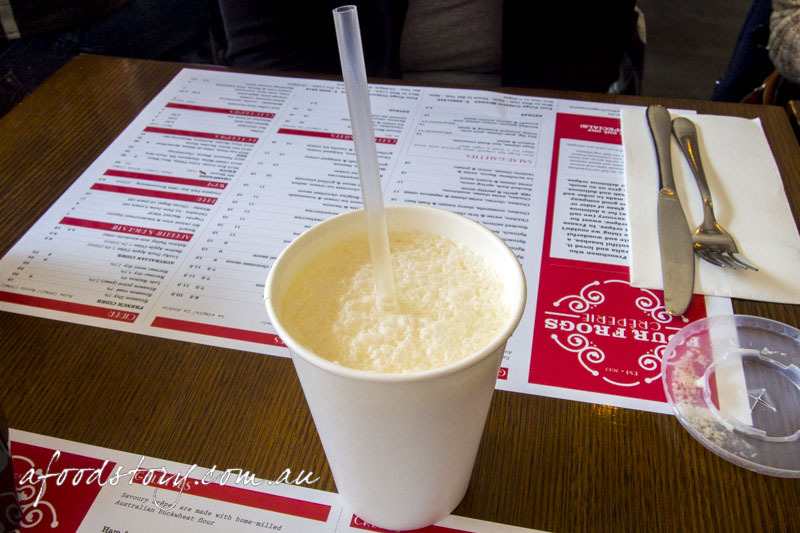 Salted caramel milkshake ($5.50 kids / $6.50 regular). And because I wasn’t drinking and therefore not downing a cider with my galette, my drink of choice was one of my favourites, a salted caramel milkshake. Now being a yo-yo dieter that I am I don’t drink milkshakes too often. But when I do I want it to be worth every calorie and there are two things it needs to be: creamy and flavourful. Tick and tick. This kids size milkshake (damn, should have got the regular size) was nice and rich on the caramel front with the perfect amount of salt to offset the sweetness, plus it was super creamy. Unfortunately for me I downed it in a few gulps. Prosciutto, tomato, mozzarella & parmesan ($16.00). Dylan probably would have been satisfied with just a coffee (seriously, who doesn’t like breakfast – or brunch for that matter?!?!) but after much consideration he finally chose the prosciutto, tomato, mozzarella and parmesan galette. It was nice to see the galette come out with the prosciutto in prime position on top and not hidden away or non-existent. Another solid galette the prosciutto was shaved and fresher than the usual deli fare. Having said that the galette fell a little short in comparison to my vego option; it needed a little extra oomph from the mozzarella to match the salty prosciutto and tart tomato. Special – banana, maple syrup, vanilla bean mascarpone, almond praline ($16.00). Dylan’s “I don’t have room for dessert” mantra *almost* made me feel too guilty to order a sweet crepe. But then I decided that would be rather foolish of me. And Dylan said he’d have “a bite” so immediately all guilt washed away. The choice wasn’t easy but after much deliberation – and consultation with the waitress – we settled on the special. It was the maple syrup that hooked Dylan but for me it was the almond praline that sealed the deal. 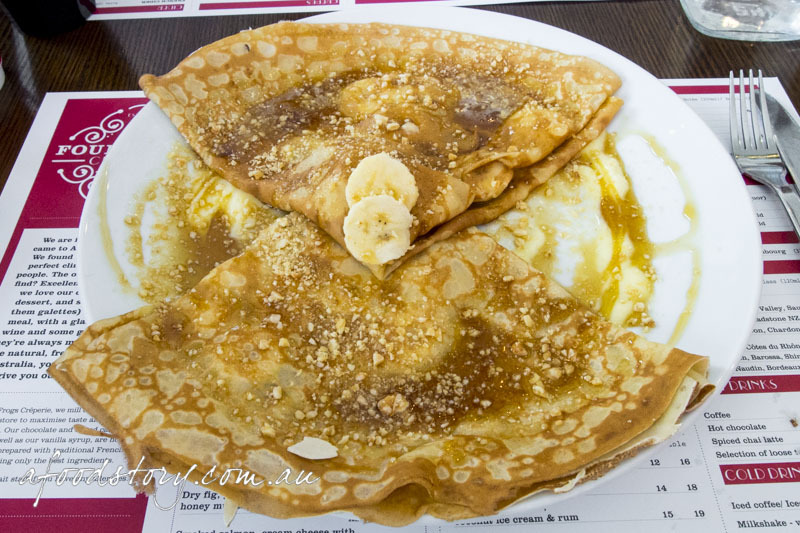 Two superbly cooked crepes with chewy praline, tart mascarpone and a spot on amount of fresh banana and maple syrup made for an excellent sweet treat. I’m not usually a maple syrup fan but this was one instance where the perfect drizzle of syrup just made the dessert. Loved every mouthful (and next time I am not sharing). I’ve considered going back to Four Frogs on a number of occasions but it’s just that little bit too far away for me to pop in to and I’m yet to make it back. Having said that if anyone is keen for a crepe date I am in! 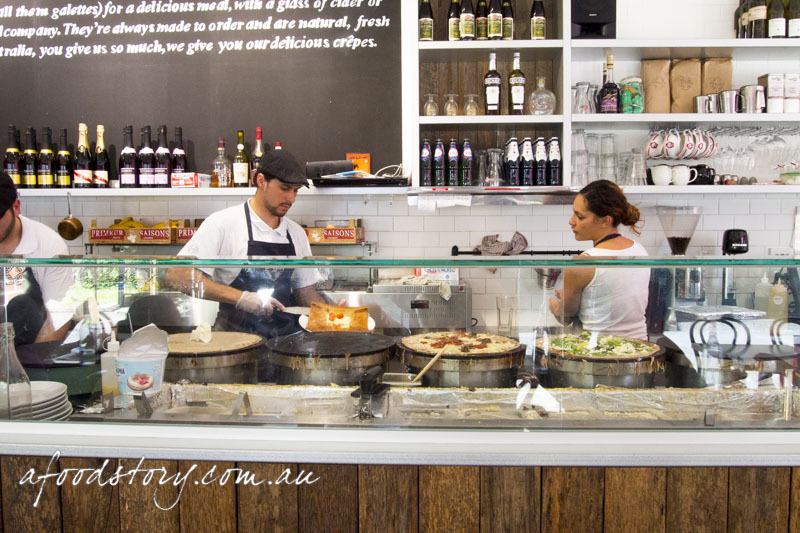 And if you have any other creperie recommendations around Sydney let me know!